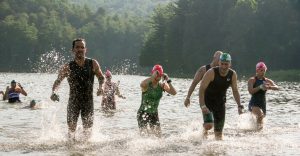 The clinic includes a lifeguard supervised open water practice swim and clinic in pristine Lake Arrowhead; a review of the race site and transition area; plus a chance to ask our team of coaches any questions that you have about the event. You are welcome to bike and run the race course on your own as well after the clinic. Presented by, Race Director Ken Racine. 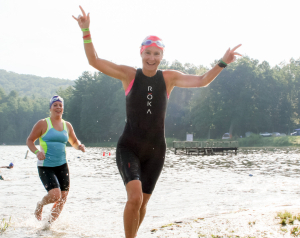 We will be there to talk about open water swimming and give tips for success. Most of all the practice is an opportunity for YOU as the athlete to get in open water in a safe, lifeguarded, stress free, non-competitive environment that will bolster your confidence come race morning. The course will be marked with buoys and you are welcome to swim multiple laps of the course within the allotted time frame. Please note that this is not an individual stroke clinic. For the transition portion of the clinic, there will be a review of the transition area and flow from swim to bike to run to finish. * Because this is a USA Triathlon sanctioned event, there is a +$15 fee if you are not a USAT member for USAT 1-day license. What to Bring: Swimming gear, towel, goggles. Water temperature expected to be in mid 70’s to low 80’s. Wetsuits are permitted. Cancellation & Refund Policy: Racine MultiSports has a NO REFUND policy. However, we do offer discount codes for those canceling during our cancellation period. A discount code for 100% of your race registration fee will be offered until 14 days prior to the race date. No discounts codes will be given within 14 days before the event, if the event is not sold out. Discount codes can be used to register for another Racine MultiSports event and will be valid for 12 months after the event date. Special Thanks: A very special thanks to the Town of Luray for allowing us to conduct this event at Lake Arrowhead.